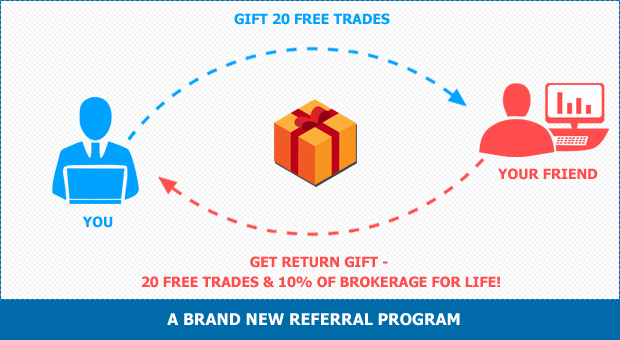 With the Brand new SAMCO Referral Program, you can gift your friends some free trades, get free trades yourself and yes – earn 10% of the brokerage they pay lifetime! What’s new in this Program? For every friend you refer, we’ll gift your friend 20 free trades on your behalf. 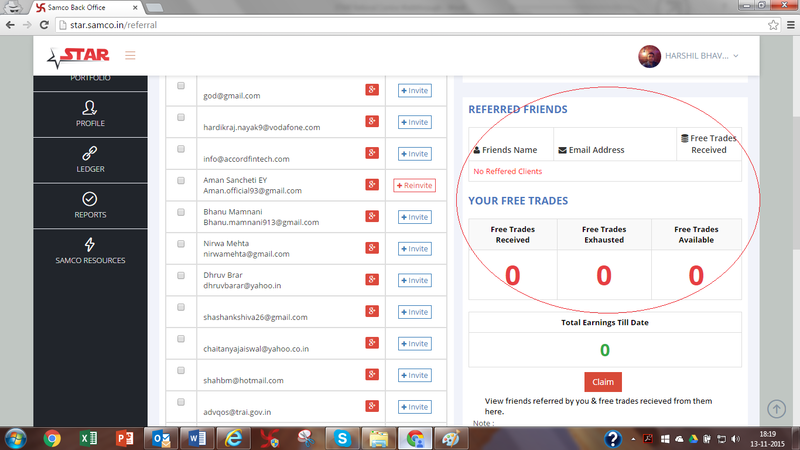 You get upto 20 free trades for every free trade your friend makes. And what does your friend get? 20 FREE TRADES on Opening an ACCOUNT. 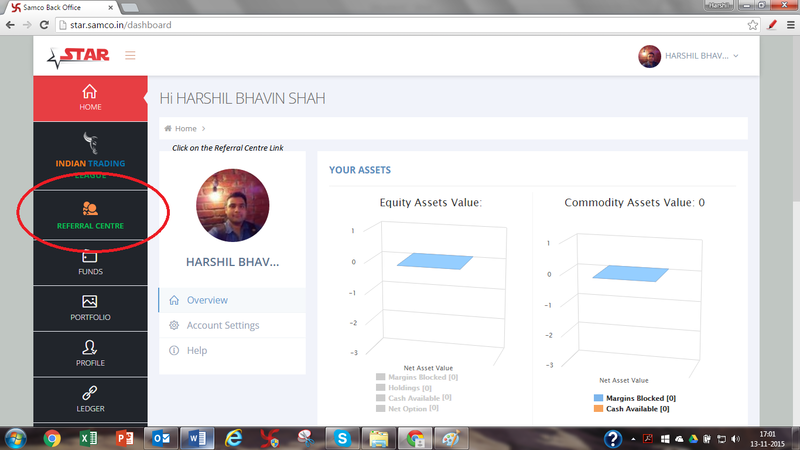 Becoming a part of India’s most vibrant & dynamic trading platform the ITL. It’s a WIN-WIN for you and your friends! Login to your Back Office Account. Click on the Referral Centre. 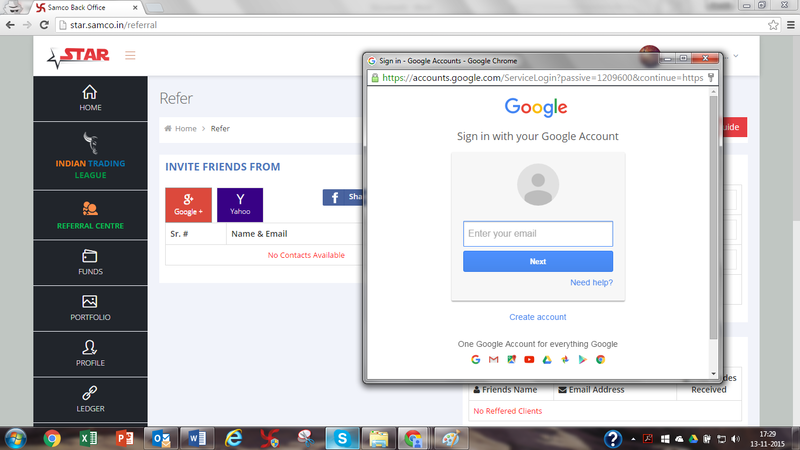 Just click on your email provider’s link and enter your credentials. 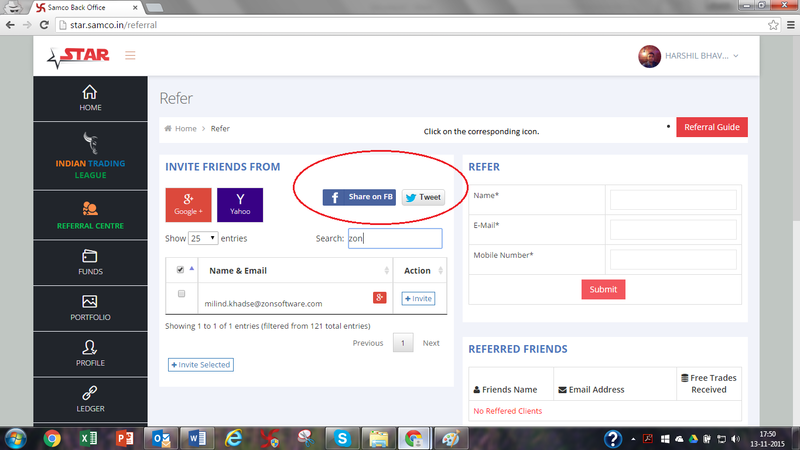 Once imported, you can import, select contacts to invite and click the +Invite Selected Button. We will send emails with a unique URL to your friends. Any friend that uses the link will be considered referred by you. 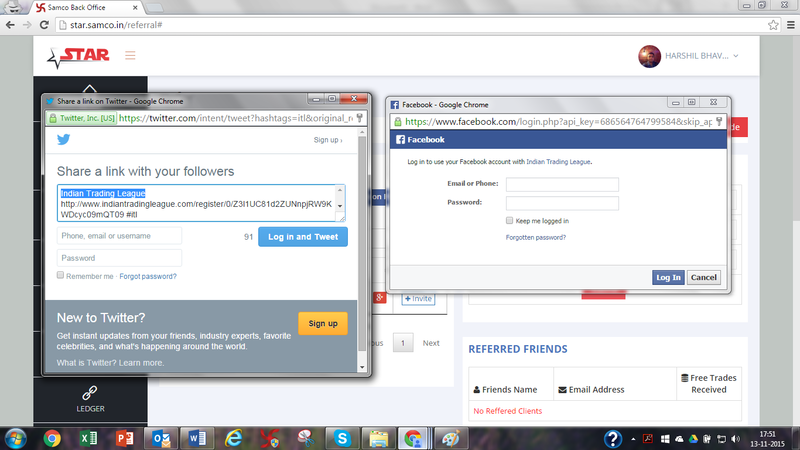 Apart from E-Mail contacts, you can also post a unique link on Facebook & Twitter! Enter your credentials and authorise the App. Now anyone who uses the link will be considered referred by you! If you want us to personally get in touch with your friends, simply enter their details in the Box on the right and we will take care of the rest. There are NO CAPS on the number of friends you can refer. In fact you can create a nice stream of income by simply referring friends & family. Now that your friends are on the ITL, how do you go about viewing your friends referred by you and claiming your free trades? In the Referral Centre, below the “Refer” box, you can see a list of friends referred by you and free trades received from them individually along with a summary of free trades received and utilised. 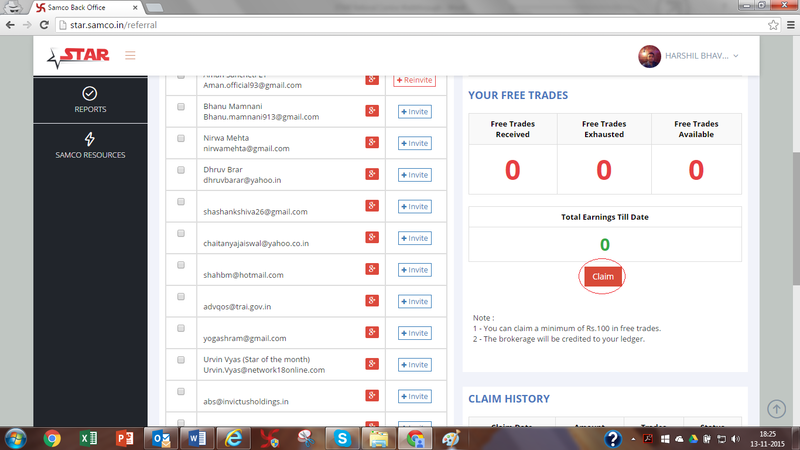 To claim your free trades & referral earnings, simply click the claim button. You will be able to claim your refund for free trades only once your amount crosses Rs. 100. Also, refund claims will be directly credited to your ledger account within 7 working days. And don’t worry in case you have forgotten something. 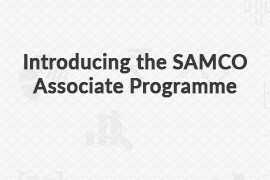 You can take a tour of the Referral Centre in the SAMCO STAR any time! Or give us a call and we will be glad to help you! Note – This referral program is only available for the existing registered customers. 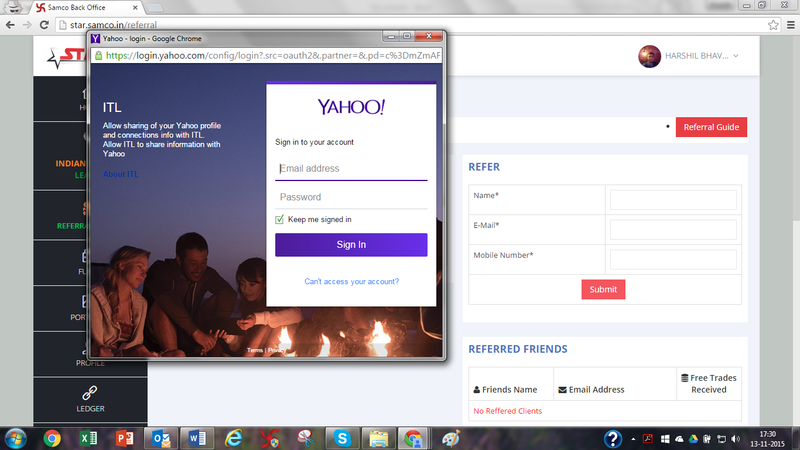 So in case you want to join this program, you’ll first need to open your account and then can start referring. While we don’t give specific recommendations on stocks. Since you’re asking about options – you should refer our Option Fair Value Simulator – https://www.samco.in/option_fair_value_calc/ – This will help you understand the real value of the options and make a decision on whether the options are over/under priced and act accordingly. Can you please help us with your Contact number?